Have You Upgraded to “Mavericks” Yet? OS X 10.9 “Mavericks” has been around since October 2013 but there have been some minor install issues as well as problems between Apple’s Mail and Google’s Gmail since Mavericks’ introduction. Apple’s recent release of the 10.9.1 back in mid-December, however, fixes many of those major issues. Apple’s website does a good job of covering some of the advantages that Mavericks offers you. If your Mac is capable of running Mavericks, now seems like a safe time to make the upgrade if you haven't already done so. All Macs capable of running OS X 10.8 “Mountain Lion” are capable of running Mavericks and the best part is that Mavericks is a free update. If your Mac is one of the above or newer, you can upgrade directly to Mavericks from Mac OS X 10.6 “Snow Leopard.” Mavericks does require that your Mac has a minimum of 2 gigabytes of RAM/memory. I would only suggest that you upgrade if your Mac has at least 4 gigabytes of RAM. Anecdotally, your Mac should have 8 gigabytes or more to run most efficiently and effectively under Mavericks. Generally, if you have 2-4 GBs of RAM, you should be able to at least double the RAM you have for less than $100. If you think you need more RAM in your Mac, please click here. Before you download and install the Mavericks upgrade, you should make a full backup of your hard drive. Give yourself a safety net in case your install goes awry. For more information on how to back up your Mac, please click here. You should also run Apple’s Disk Utility (Applications folder → Utilities folder → Disk Utility) to verify your hard disk to ensure that there are no physical errors with the hard drive that could negatively impact you while you upgrade to Mavericks. I’d also suggest running a utility program such as Cocktail to repair disk permissions, clear caches and log files, and run various maintenance scripts to help ensure your upgrade is successful. Speaking of Mac OS X 10.6 Snow Leopard, Apple has provided both security and general updates for it for many years but there are rumors that that support will end soon. Once Apple drops support for Snow Leopard, updates for major web browsers (e.g. Safari, Firefox, Chrome) and plugins like the Adobe Flash Player will also likely begin to require newer versions of the Mac OS and you may not have a choice but to upgrade. I would suggest that if you are still running Snow Leopard on your Mac and your Mac is capable of running Mavericks, you should consider upgrading in the near future. You can get your free copy of Mavericks via the Mac App Store. 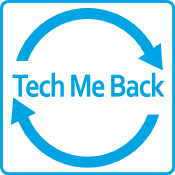 As always, Tech Me Back LLC stands at the ready to assist you with upgrading your Mac so please don’t hesitate to call or email us. Tags: Have You Upgraded to “Mavericks” Yet? 34 Years of "Thinking Different"
Hello? Is there anyone out there? RAM, Memory, Hard Disk, Oh My!